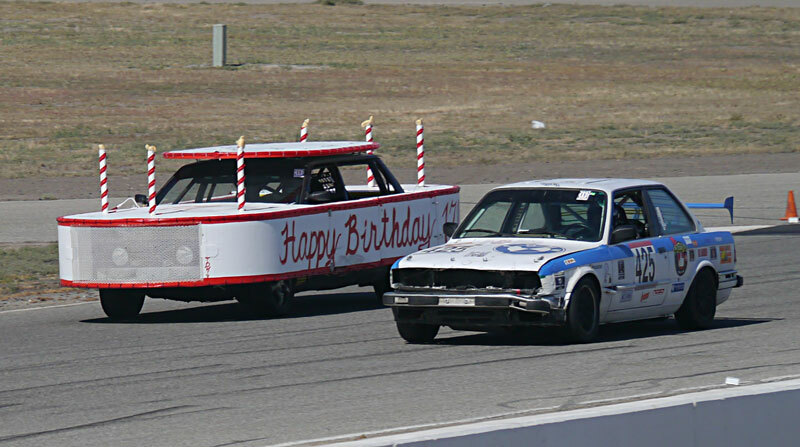 The Clowntown Roadshow runs a 24 Hour Race! 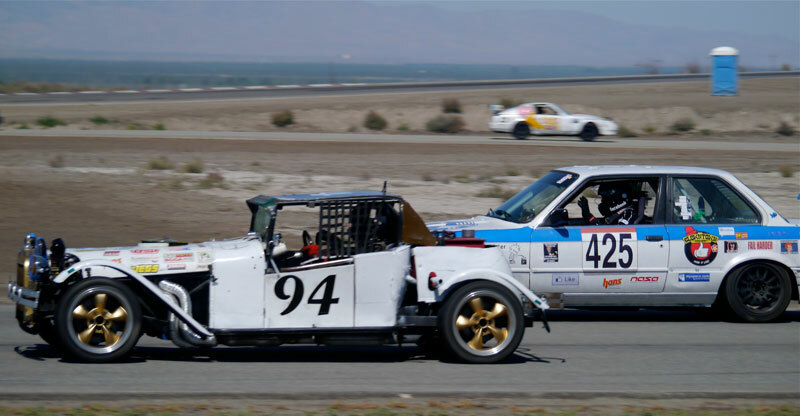 and now, Buttonwillow again for the 2012 Arsesweatapalooza. 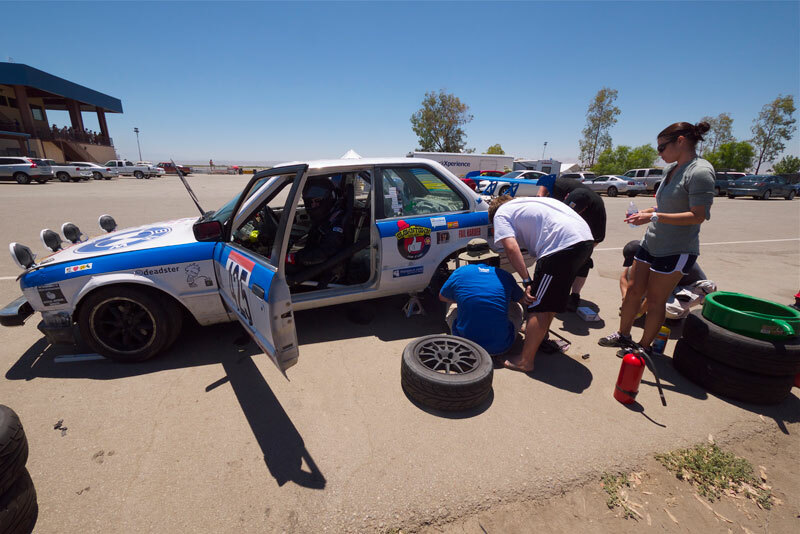 The Clowntown Roadshow completed our third Lemons race, and our very first true 24 Hour event. We did “good” in that we all had two shifts at the wheel, and didn’t irreparably break the car. We made a bunch of mistakes, but also did some things right, and all had a ton of fun. 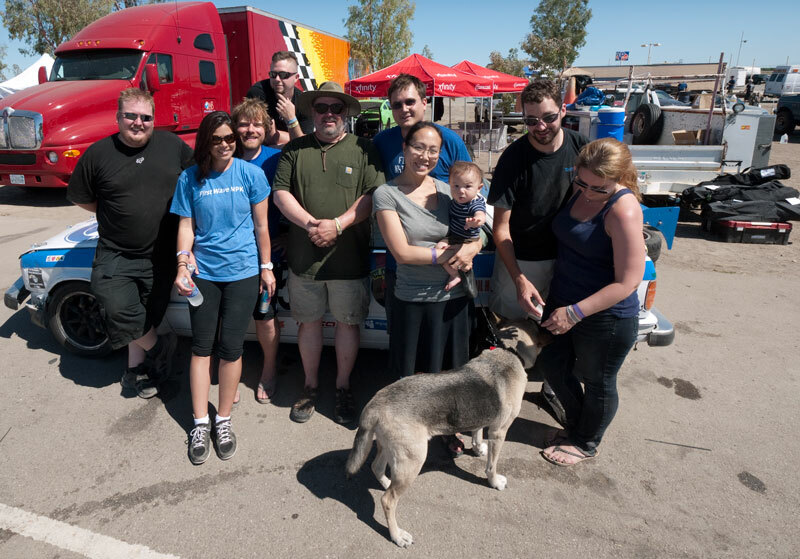 I flew down to the Bay Area last wednesday, and spent Thursday at Facebook HQ attending some meetings before hopping in our team tow vehicle – an un-airconditioned early 90s Ford F250 with utility bed, and driving south for Buttonwillow, which is near Bakersfield in SoCentralCal. Yes, it was HOT. Insult to injury was the 100+ minutes I spent in stop-and-go traffic due to some construction on I-5 about halfway there. I survived (barely) and enjoyed the combination of the best Carne Asada (I’ve had since La Hacienda in Arlington, WA) and the worst Motel 6 (ever on the planet) in the non-town of Buttonwillow, California. Friday was a practice day, and we had too much fun lapping the track, then put the car through Tech & BS Inspection – passing both easily. We enjoyed a team dinner at a small Italian place in Shafter, CA. Since I noted the place was owned an run by some Thais I ordered a Pad Se Ew off the back page of the menu and was blown away by how good it was. Pro Tip: If you dine at Giovannis in Shafter, go for the Thai! Saturday at 10 am the race started. We ran the #15 config for the terminally curious. I volunteered to take the first shift to avoid the heat of the afternoon. 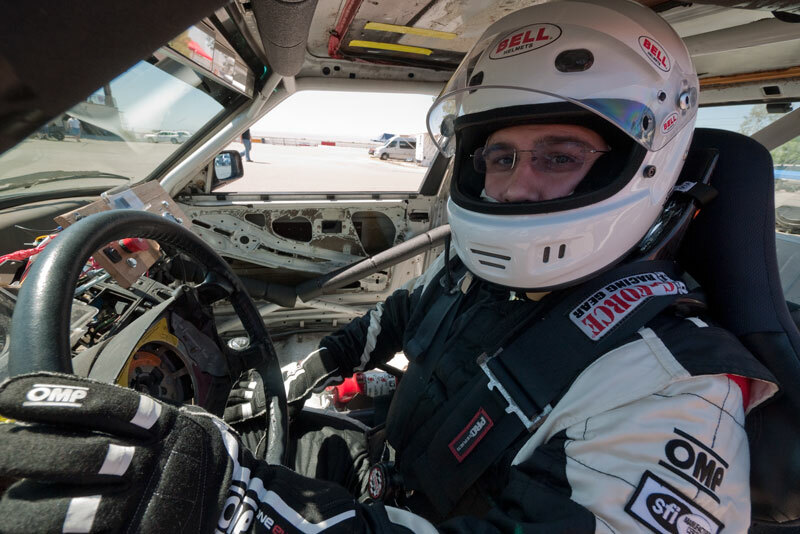 Unlike previous Lemons races where the start is laps and laps of full-course Yellow the green flag flew on my second or third circuit of the track. At the start I was a few cars behind the infamous Rolling Chicane Limousine, this race in the guise of the Titanic. Thankfully I was able to pass it just past the start-finish line. Even though we had replaced the instruments after Sears Point, the gauges didn’t all function properly – notably the gas gauge. I had no idea how much fuel I had left, so I just kept driving. The gauge never moved for what seemed like hours, and due to the glare of the bright sun I could not see the time on our dash-mounted iPhone that does car-paddock comms and telemetry. It finally started moving but I never trusted it. 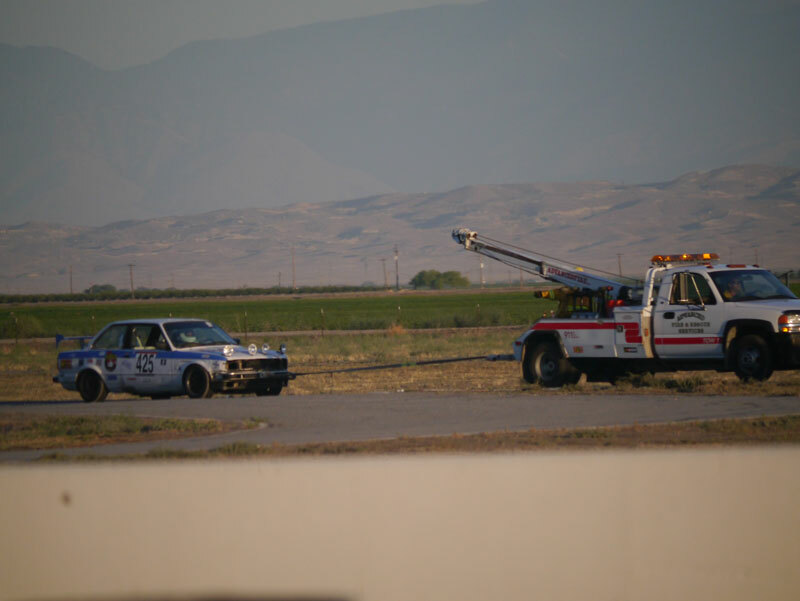 When it was around halfway, I was involved in a near-collision at the end of the short I-5 straight. A car had stalled and was trying to exit the track on the left side, I was right behind another car who rather than passing it on the right, came to a full stop. The corner workers had the yellow out, but as it was a yellow, not a red, I swerved right around the stopped and stalled cars, as I had no mind to be involved in a pile-up as the rest of the pack behind me rushed in. A few laps later I was black-flagged and went off to the penalty box. Judge Phil told me it was for passing under yellow, and I successfully plead my case – he took away the black flag, but asked me how long I’d been driving. When I answered “What time is it?” he laughed and said “Driver change!” and sent me off to our paddock. Upon arrival I assisted with the driver change, helping Elliot Sims, the next driver up, into the car, and refilling the driver’s water bottle, dowsing him with cold water, setting his harness, etc. The rest of the team decided the rear brake pads should be changed, so I kept Elliot company while he sat in the car waiting for the work to finish. Once Elliot was away on the track Matt informed me that I had worked our team up to 9th place before I came in(!) Sadly, the brakes put us 50-some places back. Lesson Learned: Start a 24 Hour event with fresh gear! I spent the rest of the day trying to stay cool, shoot photos, trying to stay cool, get some rest (impossible in the heat) and trying to stay cool. The day went by in 2 to 2.5 hour intervals with people on the track with intense period where drivers were changed. As the sun started coming down we had another driver change and when we discovered two of our four lights would not illuminate. A marathon troubleshooting session began that, if I recall correctly found two faults, but burned over 2 hours of track time. The lights finally were fixed and the car got back on track. Originally I was scheduled to run again around 12:30 AM, but the delays that had built up pushed my next shift a few hours later, so I climbed into the hammock I had strung up in the truck bed in a moment of sheer genius, and enjoyed a little combat nap amongst the loud buzzing of cars on-track, and the chaotic clamor that is a paddock during an endurance race. My shift came about an hour before sunrise, so it felt like the Dawn Patrol. 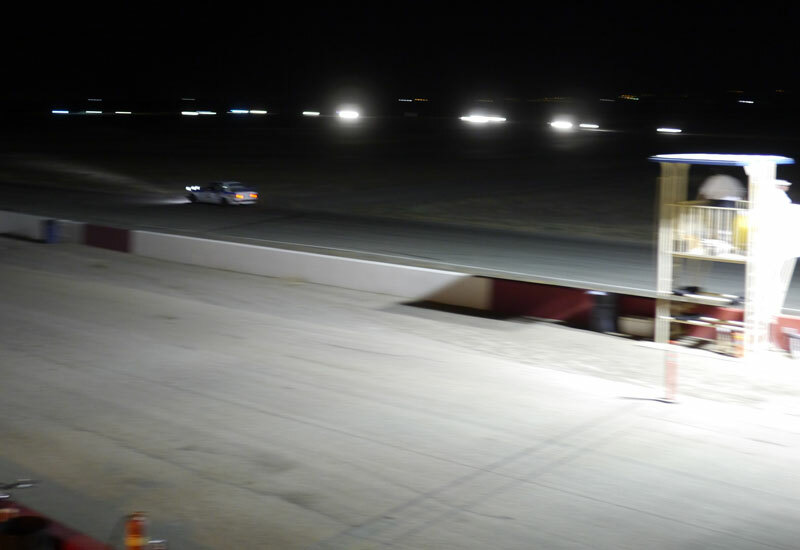 Racing at night is a bit spooky at first. Even the slightest off-track move by so much as a single tire sends up a cloud of fine Central California dust that completely blinds you, as unlike daytime, the area beyond it is dark, so all you see if a giant brown cloud. Of course the drivers are missing apexes by feet rather than inches, so the dust seems to always be a factor. Some cars have blinding lights, others (especially the Titanic‘s) are highly entertaining! I can see much better than in the daytime though, as I’m wearing my prescription glasses (I really need to get prescription sunglasses one of these days!) and I’m having a great time. Most of all, a long-running issue with the car – a sort of rev-limiter like cutout at 5100 RPM has cleared up and it can now rev right up to the actual rev-limiter at 7k. Passing cars is now a breeze, and I begin to realize why some many of the other E30s have always blown by us! My lap times are not much better since overall speeds are down in the dark, but it feels like I can go much faster for short bursts. Eventually the sun comes up, and my fuel light starts blinking on corners, then soon comes on solid. It has only been about 2 hours on-track, so obviously Elliot and I failed to fill it all the way. I signal the paddock that I’m pitting with our iPhone and head in. Donald is next up and not long into his shift Matt notices on the iPad that he’s not moving out on the track. Back at the paddock Donald reports that the gearbox is broken – can’t shift into 1st, or 3rd – and the car stalled and he can’t start it. Of course he tries the starter again in the paddock and it fires up. By now the race is almost over and we just let the car sit for a while before Callahan climbs in for the last 10 minutes so that we can be out there for the checkered flag. We had a blast. We learned a lot. 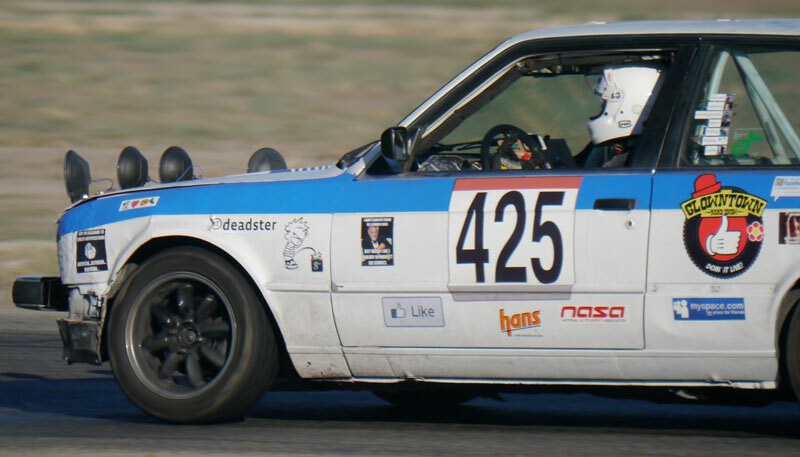 We finished ~55th out of ~150+ cars. Best of all, I didn’t spontaneously combust in the central California heat. Now we have a car to fix. I drove the truck & trailer back up to the Bay Area, worked another full day at HQ, then flew home to Oregon. Can’t wait for the next race! “I hate California” by Jonathan Coulton. Previous Previous post: Christopher Graduates! 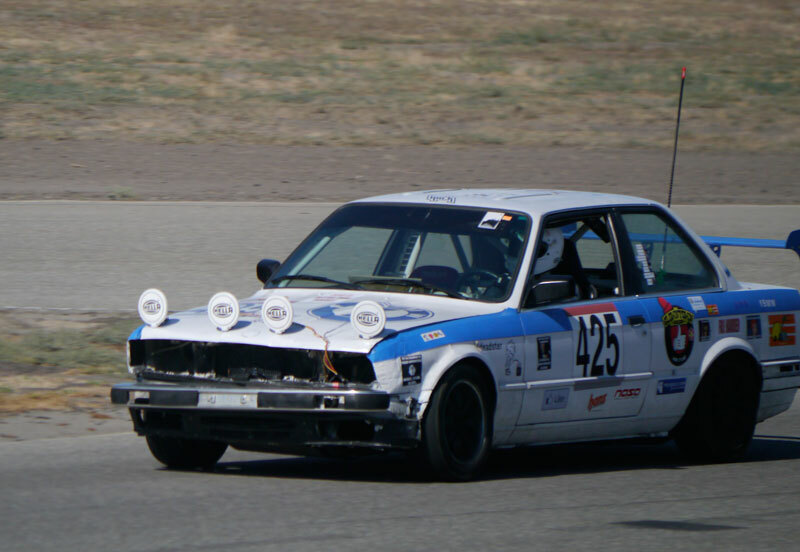 Next Next post: Another Lemons Race. Another Track. Another Team. Another Car.